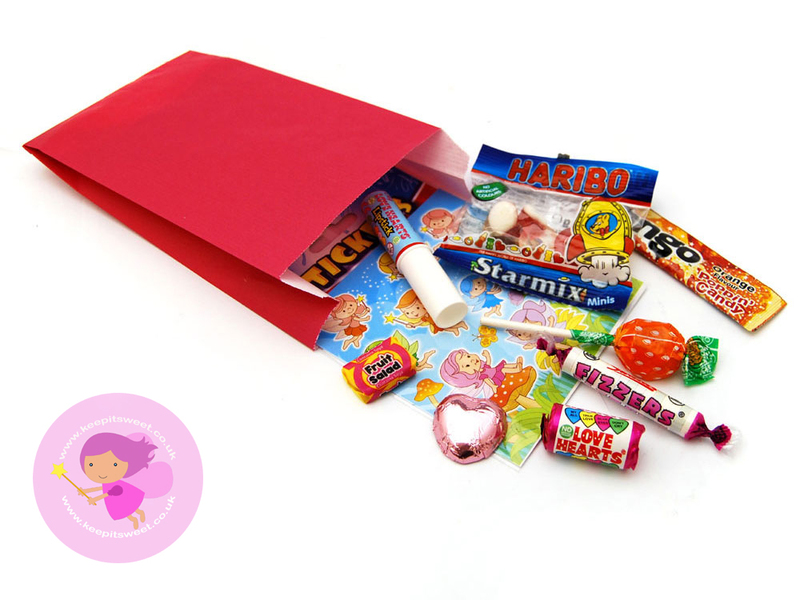 Add some fairy dust to your parties and celebrations by having our new Fairy Themed Party Bags as a treat for your guests. Filled with classic sweets such as Candy Lipsticks and Fizz Wiz this bag of treats will put a big smile on all your guests faces. 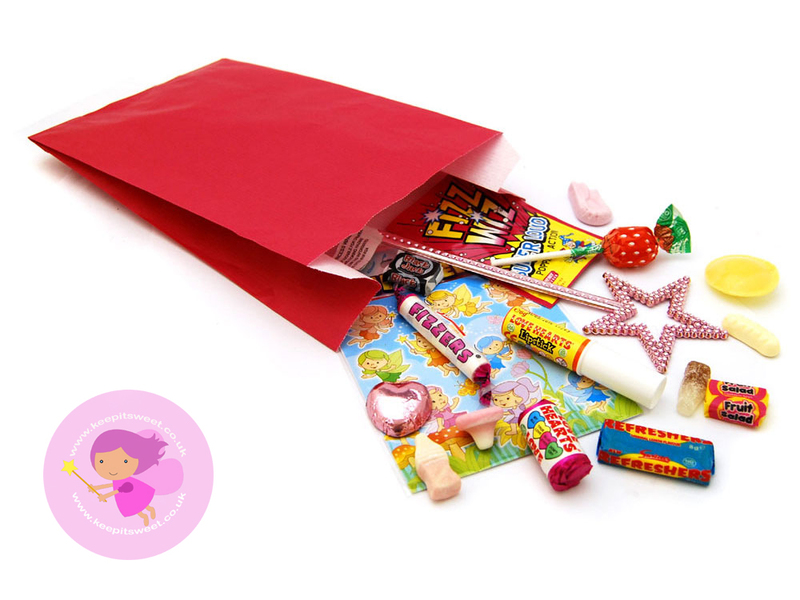 You can even role play as fairies with a wand in our larger bags! Fruit Salad: Glucose Syrup, Sugar, Palm Oil, Citric Acid, Beef Gelatine, Emulsifier (Soya Lecithin), Natural Colours (Paprika Extract, Anthocyanins), Flavourings. May Contain Traces of Milk and Soya. Milk Chocolate Heart: Sugar, Milk Powder, Cocoa Butter, Cocoa Mass, Emulsifier: Soya Lecithin. Natural Flavouring. Allergen Advice: Highlighted Bold in Ingredients list. May Contain Traces of Milk, Soya and Wheat. Candy Lipstick: Sugar, Stearic Acid, Modified Starch, Acidity Regulator (Malic Acid, Tartaric Acid), Cornflour, Magnesium Stearate, Colours (Anthocyanins). Warning: Choking Hazard. Not suitable for children under 36 Months. Fizzer: Sugar, Acidity Regualtor (Malic Acid, Stearic Acid), Sodium Bicarbonate, Modified Starch, Magnesium Stearate, Anti-Caking Agent (Magnesium Carbonate), Colours (Anthocyanins, Copper Chlorophyll, Curcumin, Lutein, Paprika). Allergen Advice: Highlighted Bold in Ingredients list. Mini Haribo Bag: Glucose Syprup, Sugar, Gelatine, Dextrose, Citric Acid, Malic Acid, Caramelised Sugar Syrup, Flavouring, Fruit and Plant Concentrates (Apple, Aronia, Blackcurrant, Carrot, Elderberry, Grape, Hibiscus, Kiwi, Lemon, Mango, Nettle, Orange, Passion Fruit, Safflower, Spinach, Spirulina), Invert Sugar Syprup, Elderberrry Extract, Carob Extract. Fizz Wiz: Sugar, Lactose, Glucose Syrup, Artificial Flavour, Flavours: Carbon Dioxide. Fruity Pop: Sugar, Glucose Syrup, Citric Acid, Flavourings, Colours (Anthocyanin, Curcumin, Paprika). Allergen Advice: Highlighted Bold in Ingredients list. Warning: Choking Hazard. Not suitable for children under 36 Months. Suitable for Vegetarians. Black Jack: Glucose Syrup, Sugar, Palm Oil, Natural Colours (Vegetable Carbon, Paprika Extract, Anthocyanins), Acids (Citric Acid), Beef Gelatine, Aniseed Oil, Emulsifier (Soya Lecithins), Flavourings. May contain traces of Milk and Soya.